This year, and tomorrow on December 6th in particular, we Finns celebrate Finland’s centenary. When Finland gained its independence, Nokia was already over 50 years old. It had lived through the last years of the Russian Empire and seen Finnish national identity grow ever stronger. We are still here today to witness and nurture a culture of innovation, entrepreneurship, equality and welfare. I am now the same age as Nokia was when Finland was born. In my 50 some years, I have enjoyed free healthcare, free education, equal opportunities, safety, stability, a clean environment, and much more – and I am very grateful. 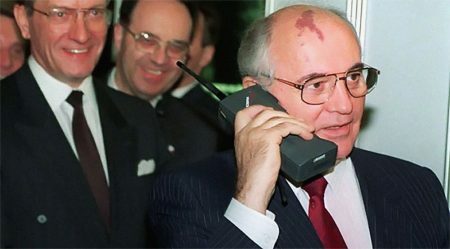 I got my first mobile phone in 1997, like many people, and of course it was a Nokia phone. I don’t know how many pairs of Nokian rubber boots my family has had over the years, but they are plenty. And I, like many other winter drivers around the world, still rely on Nokia car tires. Just as Nokia has continuously reinvented itself throughout its history, so has Finland. 100 years ago, it was a poor nation, torn apart by war, but determined to become a good place to live. A nation, just like a company, can thrive if it has strong values, and a lot of ‘sisu’. Sisu is a Finnish concept which is hard to translate. It embodies a philosophy of getting the job done well, and even more importantly, to do so with integrity. Sisu is not just about getting what you want; it’s a quality that also requires you to act in the face of adversity, learn from failure, do what you promised, and push through with what you’ve set your mind to. Just as we do at Nokia. In honor of Finland’s centenary, I have been digging into our archives, and discovered that there are several points where our histories intertwine. Nokia is part of Finland, and Finland is part of Nokia. For instance, many of you probably don’t know that one of the nation’s most celebrated president was also a member of Nokia’s Board. When Nokia issued shares in 1900, the second most significant buyer was Carl Gustaf Mannerheim, who invested his life pursuing his vision of a free Finland. When delving into our history, I learned that while many things have changed, our core values have mostly remained the same. For example, Nokia has always promoted education through related donations typically in the cities it operated. From supporting the professorship of wood chemistry at Åbo Akademi in the 1920’s when Nokia was in the paper business, to the current professorship of data science at the University of Helsinki, to the many state-of-the-art educational institutions around the world who benefit from the EUR 4.3 million donated during the last 2 years. Nokia has also actively supported the arts, collecting many works throughout the decades. To celebrate Finland’s centenary, we decided to donate our modern art collection to EMMA Museum of Modern Art in our hometown, Espoo. Looking at the archives, it was clear that Nokia was determined to trailblaze in that creative intersection between science and art – innovating to help create the future. There have been and continue to be many firsts. When times were hard and raw materials in short supply, Nokia was quick to introduce new kinds of paper products. Maybe some of you have heard of the paper bedlinen and shoes – and cellulose was even fed to livestock. We would not be here today if not for our capacity for continuous innovation and ability to respond to the changing needs and expectations of our customers and society. 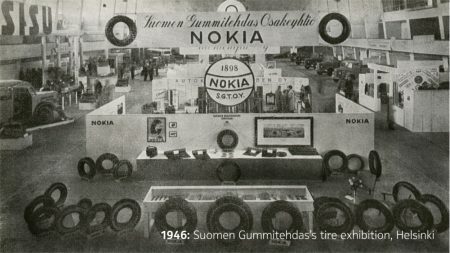 Nokia also played a significant role in developing international trade in Finland after the war, partly expedited by the war reparations. Relations were maintained with the West and the East, and the company hosted many important meetings over the years including one between presidents Brezhnev and Kekkonen in our Båtvik mansion in 1961. Even today, trade policy and the constant changes in international politics require keen monitoring and active relationships to safeguard the company’s and its employees’ interests. If the world was previously bipolar, divided between Moscow and Washington, it is now much more complex but ultimately connected. And Nokia remains at the core of that connection. Nowadays, we operate in more than a hundred countries, selling products and services to over 120 countries – and our people represent 160 nationalities. It is a vibrant, international and multicultural environment with its roots in Finland – a place where I enjoy working and living. Looking back, everything has changed and nothing has changed. Learning, opportunity, and sisu will continue to drive both Finland’s and Nokia’s future success. I look forward to the next hundred years of creating the technology to connect the world. Happy birthday, dear Finland! PS. If you’re not a Finn or haven’t visited the country, you can visit 100 moods from Finland to get into the mood. It’s another project we supported this year, capturing spectacular 360 views. Minna is Vice President, Corporate Affairs, and responsible for Nokia's Corporate Responsibility, Government Relations, Internal and External Communications and Social Media. She admits to a soft spot for everything new and exciting, but it's kept in check by her Master of Law degree and commitment to doing the right things in the right way. We did it again – no oops about it!